Last week, in order to bring the celebrations of our 75th anniversary as an archaeological Institute a commemorative stone was unveiled in Gordon Square. 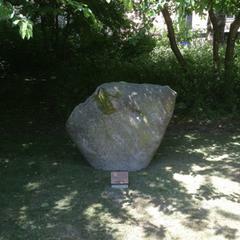 The stone itself was a squat boulder of sarsen, lifted from the edge of a field in the Kennett Valley, Wiltshire and transported to the north west corner of Gordon Square in London. The significance of the stone, in archaeological terms, is that it formed part of the concentration of similar sandstone boulders (known as Grey-Weathers or Sarsens) which are found in the Kennett Valley around the village of Lockeridge. These boulders and outcrops formed the source for the megaliths of both the Avebury complex and the Stonehenge monument. The stone is not the first monument in Gordon Sq, already there are memorials to Noor Inayat Khan and the poet Tagore; it is however a unique one, celebrating an institution rather than an individual and comprising an altered natural stone rather than a sculpture. The monument was unveiled with the rituals of corporate celebration: speeches and applause, and then toasted more informally with a libation of a fine single-malt. It’s a monument we can take pride in and enjoy along with the wonderful square on a sunny day. But despite my best efforts to spread the rumour that it’s aligned towards the sunrise on Mortimer Wheelers birthday, the stone has no further expressed significance to us an institution. But of course stones in a landscape, even an urban city-centre one, have a cultural life of their own. You simply can’t expect to place a stone anywhere without it starting to perform it’s own cognitive magic, and that’s what I want to write about today, my observation of a newly planted megalith and my observation of its first interaction with a primate mind. So the next day the square was the venue for our annual World Archaeology Festival, where the public are invited to take part in activities as diverse as flint knapping, cave painting and mosaic making. I had just finished my activity, a demonstration of deer butchery using stone tools, when I noticed a woman standing behind the stone, eyes closed, a serene look on her face and her hands lightly placed on it’s upper surface. I continued to tidy up and waited until her reverie had finished and then decided to engage her in conversation. Here, less than 24hrs after unveiling, the stone was exercising some kind of pull on a member of the public and I knew this was a moment to collect an oral record of the event. Deep cognitive magic was at work. The woman was called Jane and she had travelled to London to attend a conference and had wandered into the square to find some green space and peace. Sat on a bench across the square she had noticed the stone and recognised it for what it was, a sarsen. She was drawn to the stone and had spent the previous minutes communing with it and feeling it’s ‘energy’. We engaged in conversation for the next 15 minutes recognising that we both had very different perspectives on the stone’s significance but enjoying a sharing of our different understanding of it and what it was doing. I came away feeling that something that had been rattling in my brain for a few years had crystallised. The beliefs held by Jane are very easy to dismiss as trivial, wacky or irrelevant to our discipline and yet they had connected with a memorial set up to celebrate our august institution. Jane’s experience of the stone could be dismissed as the very kind of thinking archaeological explanations attempt to counter in their interpretation of the megalithic record and yet, if we pull back our focus and examine coldy what occurred it might tell us something fundamental about minds and objects. The moment for me was significant in the sense that I witnessed the moment the stone took on a cultural life of it’s own, interacted with the mind of an individual, led to the exchange of information and forged a social connection between two strangers. I was struck by how this was a perfect example, in a raw and immediate event I was lucky enough to experience, of exactly what this blog was about: people and objects. The Sarsen stone was a modern example of Ceruania, an object apparently out of place, dropped from the sky (by crane, not lightning) that then took on cultural significance. As an unmodified natural object, moved by individual and collective human agency it perfectly blended the divide between the natural and the constructed environments; and yet this didn’t matter a jot, the stone began to organise and structure the movements, thoughts and social interactions of human individuals. I’ve written in the past, and am currently continuing to develop, the concept that objects in landscape are structured by and also structure, human behaviour and cognition. Through the primate equivalent of stigmergy, modification in the environment by an individual (or group of individuals) will form changes in the thoughts and behaviour of other who recognise that change when they encounter it. Attached significance, either prosaic or magical, is part of the mechanism which facilitates this recognition and so I have begun to feel that cultural understanding plays a big part in this process, at least within modern human communities. Jane, who expressed beliefs we might consider as New Age, possesses an aspects of cultural identity very different to those responsible for the placing of the stone. Yet there was enough overlap (an interest in and direct knowledge of the materials used to construct megalithic monuments) that an object of significance to the community who placed the stone, resonated a different significance in a member of another cultural sub-group. It will now be interesting to see how this plays out, I’m broadcasting the moment here through my blog (largely people with an academic interest I imagine), Jane may well relay her knowledge of the stone and our conversation amongst her social network (which may have a high proportion of people with an interest in new age beliefs). While the events and these thoughts are encoded and transmitted culturally through cognition, language and technology, in a sense these thoughts and my interaction with Jane are culturally embedded ‘in’ or ‘around’ the stone. Even if you never visit London, you reading this blog may have already mentally attached these thoughts to the stone, colleagues who pass the stone regularly might find themselves accessing these thoughts when they see the stone. In a sense these thoughts now have an address, existing in real three dimensional space and a defined time line. Take a moment to consider the future events, stories and thoughts that mind become attached to that stone in its considerable life time as well as the possibility that, in the million years it has shared this landscape with humans, those previously embedded in it. Let’s leave the urban modern present and consider the role of natural stones in human landscapes, perhaps within those of modern humans with apparently modern cognition in cultures which are not building monuments from such materials. Sarsen stones are often erroneously called erratics. This is wrong because they are not out of place geologically, merely represented the survival of cemented Tertiary deposits overlying the British chalk, perhaps moved small distances by periglacial processes. However, in terms of human perception the appear distinctive and separate from the natural landscape, isolated rocks or clusters of rock, lying on or emerging from the chalky ground surface. People in the past could not point to a clear exposure in a cliff of sarsen and large areas of the landscape they inhabited were devoid of such boulders. To me it is inconceivable that hunter gatherers of the British Upper Palaeolithic or Mesolithic did not notice and attach some significance to these objects in the landscape. Isolated boulders or distinctive rock outcrops are a regular but distinctive feature of our planet’s surface and, where recorded in the ethnographic literature, will have attached cultural significance in the form of names, folk-memories and deeper mythologies. Being part of an collective extended mind means that, once information establishes an orbit around an object, the information is not dependant on proximity to, or even persistence of, the object itself. It’s continued presence does however facilitate access to and the coherence of the information itself. The cogntive magic occurs in the space between cultural significance and the material objectivity of the stone, hill, tree, etc to which that information becomes attached. This propensity for humans to attach cultural knowledge and significance to objects might allow us to start to speak of objects as possessing a quality of cultural gravity, that is the degree to which an object because of its size, shape and dissonance with the surrounding landscape, will effect a pull on human cognitive processes and start to place ideas in cultural orbit around them. Landscapes from this perspective, even modern urban ones, will therefore have their own logic of attachment which we can begin to decode in terms of likely patterns of cognitive connection, extension and embedding of information. ‘Our’ stone and this little anecdote I’ve shared with you illustrates something I think we need to consider when understanding modern human cognition; the brain did not develop in a vacuum, information requires storage and behaviour is not entirely structured by agency. We live within engineered worlds in which the stigmery of human life is clearly embedded and in which information is encoded consciously in real and virtual landscapes. The pre-conditions for the evolution of this complex, information-saturated and intricately connectedly world may well lie in the structure of landscapes and the mute natural objects we encounter in them. I started the blog because I wanted to find a space to explore the relationship between people, places and objects outside of my day-to-day work as an archaeologist. I always wanted to find the contexts where aspects of the deeply rooted human past cross over with experiences and issues in the present . Then try to develop new perspectives on our current relationships with each other, the environment and technology. It’s with some trepidation that I tackle the issue of gun crime and gun culture, but in the two weeks since the Sandy Hook elementary school shootings the subject has rattled around in my brain. Perhaps it’s because so many children the same age as my daughter were slain, or the proximity to Christmas or the fact that there is a real chance this tragedy will mark a watershed in western attitudes to guns but I haven’t been able to ignore it. I’ve come to the conclusion that our cultures relationship with the gun is an immediate and urgent issue to address and if the wider discipline of anthropology really has nothing useful to say on it then we are failing the society which supports our subject and careers. So what have I got to say, as a mud-scraping archaeologist interested in early stone tools, which could be of any use? Well not much and certainly I don’t have any answers. What I do have is an inkling of perspective which comes directly from my own experience of gun culture and from my work considering the relationship between early humans and technology. I’ve come to the conclusion that we need to adopt and promote a radical and perhaps rather esoteric perspective into the mainstream if we are to collectively change cultural behaviour towards these lethal artefacts. So to begin requires something of my own personal perspective. As a kid I was obsessed by guns and the military. I spent the ages from 5 to 10 pretty much dressed in camo, was rarely without a plastic replica firearm and utterly consumed every war movie, comic or coffee table book on weapons and warfare I could lay my hands on. German weaponry in particular captured my imagination: from the futuristic looking Luger to the sleek lines and folding stock of the MP40 submachine gun. The MG42 and Twin-magazined Oerlikon were modeled in detail on the hundreds of toy soldiers and model aircraft I amassed and I longed to own a real weapon of my own, which finally at about 11 I achieved, in being given my first Airgun. But until that moment I had only interacted with the simulacra of the gun, rendered in Hong Kong factories in brittle plastic, without any real knowledge of the weight or feel of the real thing. But having watched so many hours of glorious Technicolor footage of Clint Eastwood, John Wayne, Gregory Peck, Michael Kane, Steve McQueen and other obvious heroic role models wielding guns, it seemed that by simple mimicry I was able to emulate the movement and ergonomics of handling the lightweight plastic objects as if they were made of wood and metal. I would hold them as if they had weight, slow my movements down when raising the object, hold the object tightly and precisely when taking aim and after vocalising the report of the bullet fired execute a perfect kick up or recoil of the weapon. Despite having never held a real gun, somehow my brain had mapped the experience of using a firearm through repeated exposure to media portrayals of gun use and my own mental and play-acting rehearsals of the use of these weapons. By the time I was six I firmly believe that the gun was hard wired into my brain and represented an object fairly central and of especial significance in my personal inventory of material cultural. Now all this appeared to have happened despite the fact that I grew up in the UK. My parents didn’t own guns, nor did any immediate members of my family, no one in my town ever showed me a gun and before I was 14 and joined the cadets I never held a firearm. Even the police didn’t carry firearms when I was a kid. However, the gun still permeated 1970’s culture enough to embed itself deeply in my pre-adolescant brain, reinforced largely by positive role models including the war stories of my Nazi-fighting grandfathers or the SS/Bandit/imperial Stormtrooper-killing heroes of Hollywood. When I finally became an adult the nascent obsession had thankfully waned, I left the cadets, grew my hair, and began to find new heroes, one’s who wielded guitars, pens and poetry. But I still continued to find excitement in movies in which guns occupied central totemic positions, from Leone to Tarantino: Scar Face, Taxi Driver or Dirty Harry the central characters of pivotal cultural reference points were augmented by that most powerful of personal accessories: the gun. Now I could conclude here and add to the long running argument that guns are just fetishised too much in western culture though tv, movies and video games. But that argument has been forwarded too many times to carry any real weight and I think we need to look deeper to find any real hope of a solution. There is another glib logical progression which starts with the liberal thesis “Gun’s kill people”, the realist/conservative antithesis “No People Kill People” and the more enlightened synthesis “People with guns kill people”, I’m not sure really that any of these statements get us anywhere on their own but what they do is open a chink of useful light in the relationship between humans and objects that I feel might really be use here. If I go back to my six-year-old self and think about my relationship with the gun as both a Platonic concept and plastic simulation, I get a very clear sense of how my relationship with that object transformed me as an individual. In the long-term my brain was hard-wired through play, imagination and handling to map the space the gun occupied and my ergonomic relationship to it. So much so that I could throw it from hand to hand, spin it on the trigger guard and flip it 360 and hold the gun in a firing position. This wasted ability could have easily been tracked on a musical instrument, paint brush or other creative tool but my object of choice was the gun. Instead of developing the neurological mapping of strings, piano or the QWERTY keyboard my brain mapped the geography of barrel, grip and trigger and the performance of drawing, raising, aiming and firing. Such mapping is not simply the acquiring of task specific skills, it represents the transformation of a young and malleable brain around an object. It is not simply a child learning to use a tool through play; it is the moulding of a nervous system around an extended part of its extended material culture. The effectiveness of the interaction is so loaded with values and endochrinal reinforcement that it is far more than simple skill acquisition going on here. I found playing with toy guns fun and exciting, I dread to think what was going on in my brain and those of my friends when we lay in wait for each other and sprung up simulating the emptying of a clip into each other bodies until one of us pretended to go down. I do know it was fun and I enjoyed it, that makes me suspect the experience released endorphins and adrenalin, that our play was creating powerful peak experiences around the use of simulated lethal technology. Are those same endorphins activated when we watch a movie gun fight or laugh at the wise-cracking humour of our gun wielding heroes? If so it is easy to imagine the possibility that our relationship to the gun is far deeper than cultural, we may in some respects have a biochemical relationship with it. Taking our cues from the theory of the Extended Mind, first developed by Andy Clark and David Chalmers, I feel that if we are serious in wanting to unpick ‘gun culture’ we have to understand fully the relationship between our biology, cognition and technology and stop viewing them in separate ways. The Extended Mind paradigm sees cognition as not being limited to the mind or indeed the body but existing outside and separate or, more correctly, in the space between the subject-object duality that often separate us and the material objects of our culture. If we can explore how individual consciousness is transformed permanently by exposure to or use of an object, and how that transformation is reinforced and accelerated by cultural values we may begin to see the gun from a different perspective. Not simply as a tool which can be either in the ‘right hands’ or the ‘wrong hands’. Not as an object which we should either have the ‘right’ or ‘no right’ to own, but as a powerful cultural virus which maps so perfectly to human fears, drive for empowerment and security that we are struggling to control. We might conceive of the gun as occupying almost a new class of object, one where ergonomics, evolutionary imperative and efficiency lead to its extended and deep embedding in the biotechnological human nexus. We might add the handaxe, sword, automobile and mobile phone into this class too but the guns lethality is what makes this embedding so immediately toxic. The power of an object to transform the individual into something greater, something more than human, sits at the core of the Extended Mind approach. As a species and individuals we constantly reconfigure around technology as it extends our individual and collective tolerances and influence. While we have a pretty good handle on behavioural and chemical addiction we are perhaps only at the beginning of understanding the deep embedding of technological co-dependence. Until we stop viewing the Gunman as just a man with a gun, and start viewing the Gunman as an augmented organism, a resulting cyborg nexus of biology, cognition and technology, detoxifying societies riven by gun crime might be near to impossible.